Shauna Shanica Francis was born in The Virgin Islands on July 20, 1984 to the parentage of Barbara P. Bastian and the late Edward A-A. Francis. Shauna was the second child of three. She started school in Fayville North Carolina and moved back to the Virgin Islands to finish the rest of her school years, where she graduated with pride. She loved to sing, and it was everything to her. At the age of sixteen she lost her father to gun violence. Shauna had many accomplishments in her life. On December 21, 2007 was one she cherished most. That's the day she gave birth to a bouncing baby girl and named her Sha'Nua Williams. She became a gospel singer after turning her life over to God. She also loved to preach his word to anyone that would listen. She took a break from her singing career and settled down in Orlando Florida, where she met and fall in love with her husband, Nikenson Jean Baptiste. Shauna and Nikenson were joined in holy matrimony on January 16, 2018, it was the happiest day of her life. Still feeling like she was on her honeymoon, she received another surprise. She found out that she was having another baby girl, gave birth on January 3, 2019 and named her Sha'Nekencia Nekia Jean Baptiste. 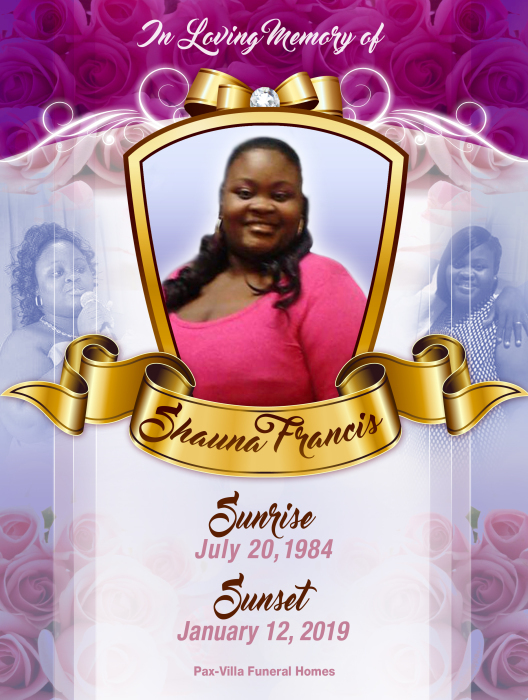 On Saturday, January 12, 2019, God called Shauna Shanica Francis Home. Shauna will be miss ,her loving smile, her friendly jokes.